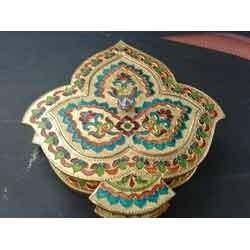 Fine Decorative Marble Mukhwas Available In Different Designs & Sizes. With the involvement of modish technology, latest machinery and advanced tools in all our processes, we are occupied in offering Mukhwas Box. We are manufacturers of minakari articles like jewellery box, key holder, letter box, bajot, mukhwas box and temples.